Aldi’s ‘Special Buys’ advertising practice will be scrutinised on an up-and-coming episode of ABC’s The Checkout. In an episode scheduled for this week, Aldi’s Special Buys will be criticised with the television show accusing Aldi of bait advertising and subsequently violating Australian Consumer Law. Every Wednesday and Saturday Aldi releases new ‘Special Buys’ which are often traditionally pricey items sold at low prices by Aldi. Special Buys in the past have included BBQ’s, vacuums, school shoes, rocking chairs and large children’s toy cars. The items are usually advertised through Aldi catalogues. Shoppers often line up out the front of Aldi stores prior to opening on Wednesdays and Saturday mornings to purchase Special Buys as Aldi so they can secure a Special Buy. There has however been a number of recorded incidents of Aldi quickly running out of Special Buy products. In September 2017, Aldi for example advertised large children’s toy cars but according to consumer advocacy group CHOICE, only had two cars at each store. CHOICE also reported that during December 2017 Aldi was selling Dyson vacuum cleaners as a Special Buy item but shoppers took to social media saying each Aldi store only had one or two in stock. The Checkout episode will accuse Aldi of engaging in bait and switch advertising – a practice where a retailer will offer a product for cheap in hopes that the consumer will instead purchase other items when they cannot get the product. In examining the issue separately, CHOICE reported the Australian Competition and Consumer Commission (ACCC) website says bait advertising is not misleading if businesses are upfront, highly visible and clear and specific about the product on sale being in short supply or only on sale for a limited time. Aldi’s catalogues include fine print that state that Special Buy stocks are limited and vary between stores. The fine print also apologises if stock sells out because of unexpected demand despite Aldi’s careful planning. In response to news that Aldi’s Special Buys will be scrutinised on The Checkout, an Aldi Australia spokesperson said Special Buys is a unique retail model. 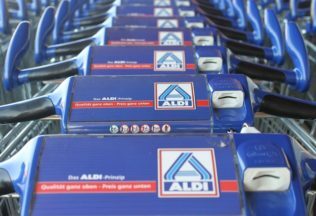 “Driving demand and disappointing customers by nut supplying enough stock is categorically not part of our business model,” Aldi Australia’s spokesperson said. “We are a retailer and we are in the business of selling as many products as we can.